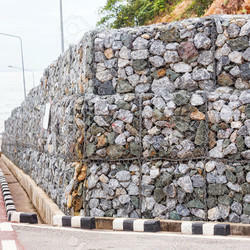 We are a leading Manufacturer of stone falling wire mesh from Mumbai, India. Used for confining stones required in construction industry in place. The product is exceptional in strength and is made from high quality stainless steel procured from an authentic vendor base. It is resistant to wear and tear and can be easily cut for installation. The product can be customized according to the requirements of the clientele.